Additional news articles can be found at Candy'sDirt.com. A rectangular concrete slab, shaded by a few live oaks, is all that remains of what once was home to about 100 residents, most of them older retirees. Two years ago, a fire destroyed the condominiums here, which were located within a 14-acre development on the north side of Northwest Highway between Pickwick Lane and Baltimore Avenue. But the blaze did more than reduce homes to rubble and devastate the residents' lives. It tore apart a neighborhood. This prime real estate serves as a buffer zone of sorts between the Preston Center shopping complex to the south and Preston Hollow single-family homes. But now, it's a prominent battleground — for a fight between developers and the city's most prominent and wealthy residents; between the condos' former owners and their neighbors; and between two Dallas political heavyweights. In one corner is Dallas City Council member Jennifer Staubach Gates, who wants to rezone the area and build anew. In the other corner, former Mayor Laura Miller, who says more density there will strangle the quality of life in surrounding neighborhoods. Miller's battles with Gates over development in this area helped draw her out of political retirement. But she said her fight is more than a neighborhood squabble in Council District 13. When she decided to run, she called the election "a referendum on development in District 13 now and in the future." Gates, in turn, said Miller's efforts are "not trying to get a good development." Instead, she said, the former mayor seems bent on "stopping anything from happening." The battle in the larger Preston Center-area war comes to a head in the midst of the election season. On March 21, the City Plan Commission is scheduled to hear recommendations from staff for zoning in Planned Development 15, or PD-15. 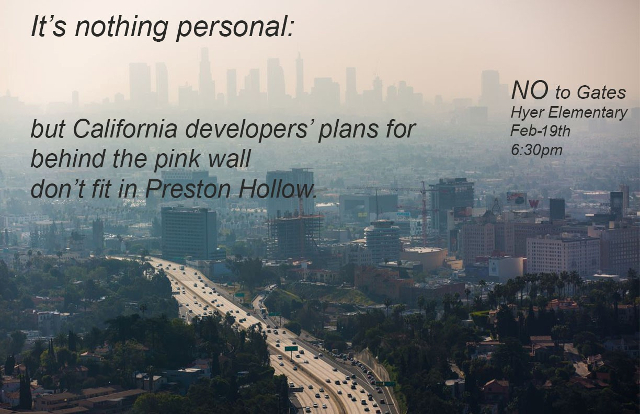 The adage “location, location, location,” applies to PD-15, the largest part of an area commonly known as “behind the pink wall,” for the serpentine pink brick wall that stretches along Northwest Highway east of Preston Road. The neighborhood began to develop in the early 1950s with luxury apartments and added condos over time. Later, the city approved zoning for the area known as Planned Development District No. 15, or PD-15 for short. The zoning governs six condo properties on a 14.2 acre tract of land in an area that includes the Preston Tower and Athena high-rises that flanked the three-story Preston Place. 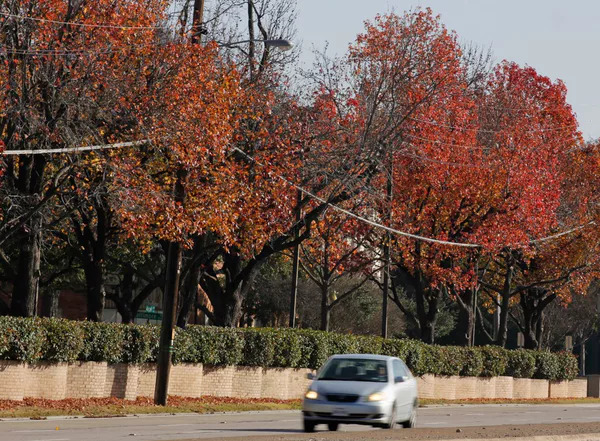 The area drew its prestige in part because its sits between Preston Center and the luxury homes in Preston Hollow, a neighborhood that claims among its prominent residents billionaire Dallas Mavericks owner Mark Cuban and former President George W. Bush. In 2015, after frequent zoning fights and concerns about traffic congestion in the area, Gates appointed 14 people to come up with guidelines for future development and plans to reduce traffic congestion in the area. The task force included Miller, who lives in Preston Hollow west of Dallas North Tollway. “We were all excited to do this plan for the area and stop all the raucous emotional zoning battles going on in the neighborhood,” Miller said. 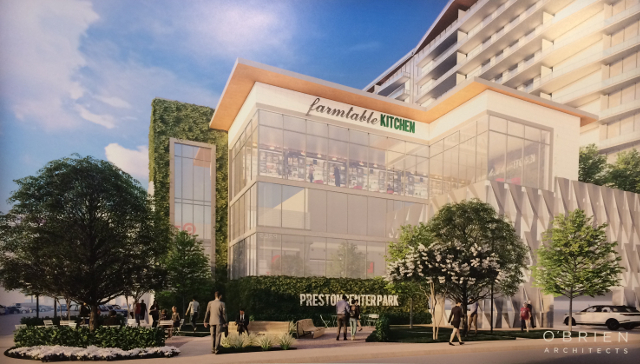 Preston Center would serve as the main area for dense development, Miller said, invoking the concept of West Village in Dallas’ Uptown neighborhood. The City Council signed off on the plan in January 2017. And eight weeks later, the fire broke out at Preston Place Condominiums. The massive seven-alarm fire started the night of March 3, 2017. The blaze killed an 89-year-old woman who lived there and destroyed cars, belongings, memories. Some pets also died in the blaze. 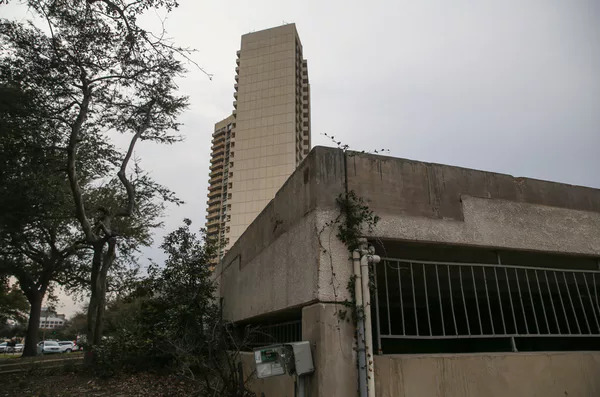 Those who owned the condos in the 60-unit complex — mostly older, retired residents — want to sell the property to a developer so they could recoup their investment and move on. During a public hearing last month, former Preston Place residents described how the fire disrupted their lives. Several said they still have to pay their mortgages on the non-existent condos. Kenny Dickson, whose parents were residents at Preston Place, said his father, Kenneth Dickson, a retired senior associate pastor at Highland Park United Methodist Church, has cancer and may not live long enough to see the property sold. The zoning issue is more humanitarian than political, he said. “The longer we wait, the more risk there is that people will die before they recoup their investment,” Dickson said. But the stakes were high, and the politics began to heat up. Miller, known as a combative politician in her decade at City Hall, accused Gates of scrapping the task force’s plan after Preston Place burned down. The former mayor said Gates told her and others that developers could not build anything economically viable within the four-story limitations set out in the area plan. Gates said she hasn’t scrapped the area plan and that “Laura is sharing wrong information.” The area plan was also a vision, not zoning law, Gates said. She said the only way to redevelop the old Preston Place site without making a zoning change would be to rebuild the condominiums with exactly the same number of units with the same configuration. Otherwise, all six properties covered under PD-15 have to agree to changes. That setup was a recipe for nothing to ever be done, Gates said, because the other properties within the PD-15 area couldn’t agree on any changes. After Gates’ neighborhood steering committee couldn’t reach an agreement last spring, the council member and city staff then launched a process called an authorized hearing. Under the authorized hearing process, city planners hold public hearings and make recommendations on appropriate zoning to the City Plan Commission. Gates’ idea was to “tackle new zoning for the whole area” rather than just Preston Place. But Miller opposed the authorized hearing process in a letter to Gates dated May 11, 2018, that was also signed by several supporters, including former council members Donna Blumer and Mitchell Rasansky. One of those developers, Provident Realty, spoke to the steering committee about Preston Place. “We’re working with Provident as the city process proceeds,” said Preston Place Homeowners Association Board president Arnold Spencer. Spencer declined to provide details, and Provident leaders couldn’t be reached for comment. He said Preston Place owners want to incorporate sustainable development and environment-friendly designs and respect their neighbors' positions. The city's plan would nearly double the allowable units per acre — up to 90 rather than the current 52 — and give developers more units if they set aside some as affordable housing. Some parts of the development could be up to about 20 stories high. 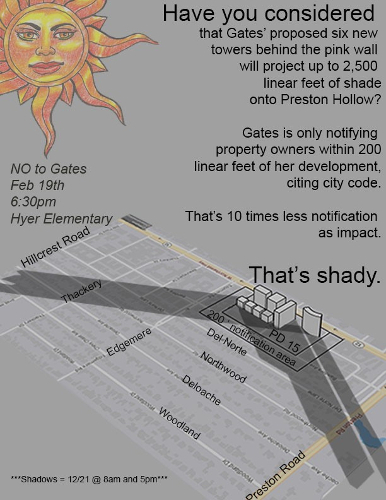 Gates, in an interview, said the density for PD-15 "makes sense because you'll get a better quality project." At the end of a Feb. 19 public hearing, Miller said the community had already spoken "louder and clearer than any other neighborhood over two years" with its message. "And it was: Don't give us more than four stories when you redevelop behind the pink wall," Miller said. Several former residents of Preston Place displaced by the fire also saw the city's recommendations favorably. Spencer said the ideas “represent a reasonable compromise and an economically viable option.” And Sharon Anderson, who also lived at Preston Place, said former residents “are stuck in limbo through no fault of their own." The coming weeks promise to be a political brouhaha. Miller said she has had to fight the same battle over and over in recent years. “For six years, neighborhoods have called me to help with zoning cases,” she said. Homeowners need an advocate, she said, and that’s why she’s running. Near Preston Center, a row of homes on Northwest Highway display large "Laura Miller for City Council" yard signs. Miller built her political career on that pro-neighborhood narrative. And Gates' background makes her a natural enemy. The council member’s father is Dallas Cowboys legend Roger Staubach, who made a second career in real estate. And her husband has real estate investments, too. But Gates has also cast Miller, who has plenty of political baggage, as a single-issue candidate focused only on development in the Preston Center area. “Effective leadership requires ... a balanced and collaborative approach,” Gates said. Claire Stanard — who lives on a street just behind the PD-15 and is the city liaison for Preston Hollow South Neighborhood Association — said she’s not happy with the Miller-Gates battle. “I feel like the election has devolved into two extremes: pro-development vs. anti-development,” she said. Getting the city planners involved in the process was the only way to move forward, Stanard said. “None of the sides could agree. Everything kept ending up in a stalemate,” she said. “But the city does need to listen to the community input,” she said. Stanard plans to attend the March 21 public hearing on the city’s recommendations. As for who will get her vote on Election Day on May 4? Right now, she said, "I’m not sure." While Thursday’s meeting fell short of the usual fireworks expected, the City Plan Commission asked some great questions regarding city staff’s proposed changes to PD-15. Commissioner Jung was next (at least I think it was, his back was to me). He wanted to know what would happen to all the non-conforming things that would result if the proposed changes were adopted. He called out the carports on the PD’s northern alley, two caretakers’ cottages-turned-condo, and the towers themselves (which would violate the proposed residential proximity slope). The answer was essentially nothing would happen until a property redeveloped. Commissioner Shadid followed up Schultz’ comments on the usability of the proposed affordable housing sweeteners. Ruegg wouldn’t comment specifically on their likelihood of use. District 14 appointee Paul Ridley focused on the burned Preston Place lot. He wanted to know if their existing footprint was grandfathered in. It appeared the current Tulane Blvd. buildable lot line would encroach on the proposed setbacks – should someone want to rebuild the old Preston Place exactly as it was. It got mildly confusing when Ridley seemed to mix the 66 surplus lots into Preston Place’s original 60 units. City staff didn’t seem to understand Ridley’s apparent misunderstanding. For clarification, Preston Place’s 60 units are not part of the 66 surplus units (which are a shared resource among the other PD-15 parcels). The surplus units are the result of PD-15 being changed to reflect the density of a never-built high-rise on Preston Place. 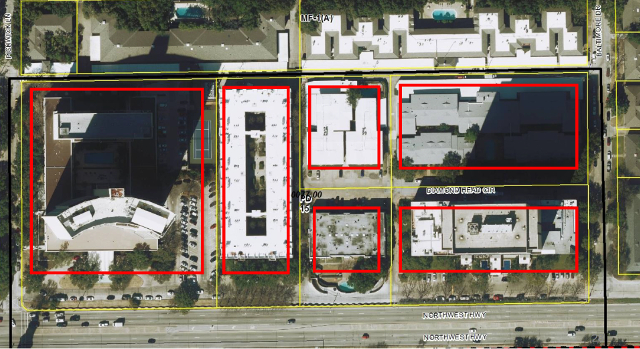 When that planned 125-unit complex only resulted in the 60-unit Preston Place, the shared resource of today’s 66 surplus units was created because the PD was never changed to remove the unbuilt units. The final commissioner to ask a question I’ll leave nameless because the question was embarrassing. This commissioner wanted to know how the area would be replatted should a single-family home builder wish to develop within the PD. I call it embarrassing because no one is going to pay the land price only to plop what would he hugely expensive homes in the middle of a neighborhood that on a generous day would be called middle-class. Although, never say never. In 2006, someone built townhouses in Farmers’ Market on land zoned CA-1 providing unlimited height, 100 percent lot coverage, and 20-to-1 density. From above, it’s easy to see the structure of the four Northwest Highway-facing buildings are essentially in alignment. There’s a reason. In 1945, “Preston Tower” was called out on a city survey and notes the 100-foot setback minimum. In 1963 there’s another survey that extends the 100-foot setback across all four parcels. In 1966, a contract was signed by each of the four parcel owners that called out the 100-foot setback and the 50-foot right of way – it states changes must be unanimously approved. Each owner’s title documents list the 100-foot setback. Today, there are two parcels who could feasibly take advantage of a reduced setback. Preston Place has a roughly two-acre parcel and so given its size, doesn’t need it to build a good building. Royal Orleans is a small parcel with an equally small buildable envelope. Should one building be pulled out of alignment? And for what? Even assuming it was legal (which seems doubtful), the proposed 70-foot setback guarantees a poor pedestrian experience. As seen in the yellow box above, the 70-foot setback is only good for the first 45 feet in height. Above 45 feet, the Northwest Highway urban form setback of 20-feet kicks in, producing a 90-foot setback above 45 feet in height. The only benefit of the 70-foot setback is to the first 45-feet of a potentially 240-foot tall building – you know, where the pedestrians are supposed to be. Reviewing the numbers, the proposed changes call for 10 feet of (pink) wall/green space border along Northwest Highway. There’s a 50-foot public access frontage road. A 70-foot setback is 10 feet back from the frontage road. But wait, the plan also calls for up to 15 feet of encroachment for porticos and such. Someone’s missing 5 feet. The result is that the neighborhood winds up with a landing strip of sidewalk and the occasional bush flanked by neighbors who, while having porticos, also have pretty good front yard landscaping. The towers also use the 100-setback for drop-off outside the active roadway. By comparison, a 70-foot setback would result in road-blocking drop-offs. The solution here is obvious. 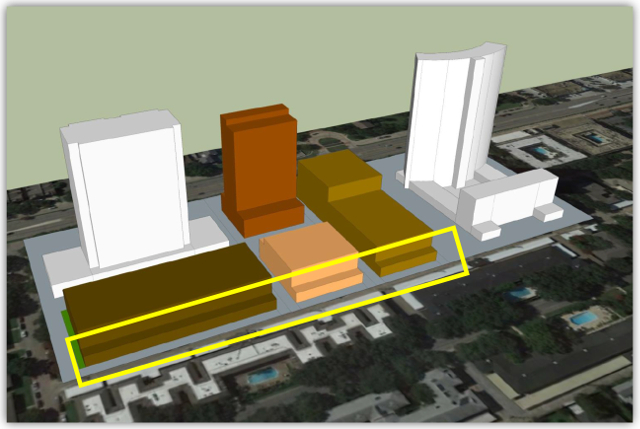 If the urban form setback along Northwest Highway is ditched, it results in a flat face to Northwest Highway (boo-hoo) that if pushed back to the 100-foot line results in a potential building having the same (or more) buildable square footage without messing up the very streetscape the plan is trying to engender. A four-story encroachment into the 100-foot setback is a poor exchange for an urban form setback that benefits no one (that would be challenged in court). On the northern boundary is another setback that needs looking at. While I’m all for the single-family RPS being instituted, the multi-family version will cause unintended results. The goal for the “back” northern lots is to keep them lower than those on Northwest Highway – it provides a needed step-down between the existing height on Northwest Highway and the two-story developments to the north. Lower buildings also tick-off the existing towers less. Single-family RPS does this just fine. What multi-family does is knock off the lower floor backs of potential buildings along an alley. The existing buildings across the alley are two-story with bedroom windows facing towards the alley. The ground-floor windows of those buildings are below the corrugated steel carport roofline – their “view” is of a car hood and a white painted steel sky. If a 100-story building was built, the views from those windows are unchanged. The second-floor windows are rarely unobscured by curtains or shutters, signaling their view is already not worth viewing. Being zoned MF-1 and deed restricted on top of that, change across the alley is extremely unlikely. BUT, if the multi-family RPS chunks out enough of the lower floors to force a building to go higher due to less efficient geometry, that’s a poor trade-off for the neighborhood. For example, because the dimensions are known, would the currently proposed 85-foot Diplomat replacement be forced to jump up to a full 8-stories to make the geometry work? I don’t think there’d be much neighborhood support for an extra floor in exchange for the multi-family RPS. Especially when it impacts an alley and buildings whose poor views are likely to be impaired further. However, an extra story will make them darker as more sky is taken. There are nuances to setbacks whose cost/benefit to the resulting neighborhood should be considered more closely. The city is limiting density to 90 units per acre. They’re also limiting lot coverage based on height – under 96 feet tall requires 65 percent coverage, and from 97 to 168 feet tall, coverage drops to 55 percent. Anything over 169 feet tall can only cover 45 percent of their lot. For Royal Orleans and its existing setbacks, their coverage is less than 45 percent already, so they could theoretically build the full 240 feet of height. But at 90 units per acre and an 11-foot floor height (10-foot ceiling plus 1-foot gap between floors) that’s 21 stories. But their lot is a pinch less than an acre and results in a buildable floor of roughly 16,000 square feet (minus setbacks, hallways, gym, office, etc.). Assume an average of 1,000 square feet per unit. That’s 16 units per floor and they can build 90. That’s six stories. If they wanted 12 stories, it’s 2,000-square-foot units on average. Even maxing out the city’s affordable housing and green space sweeteners, bringing the total to 125 units per acre, those additional units will likely add two floors. Most likely resulting in eight stories – remarkably similar to A.G. Spanos’ plan for the Diplomat right behind Royal Orleans on a similarly sized lot. And there’s another limiting factor the city can’t really address. The cost of parking a highly-dense building on a small parcel. Underground parking is really expensive. 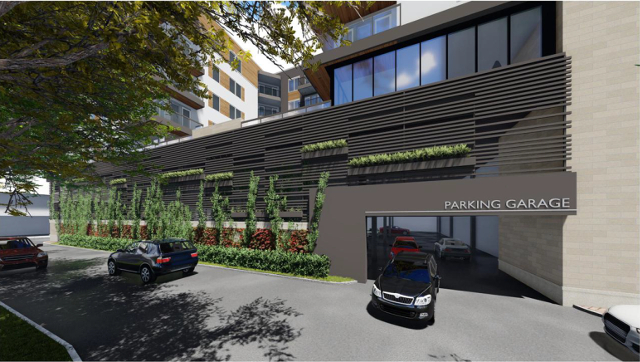 A developer would be hard-pressed to dig economically enough to provide the needed parking for a tall building assuming the 1,000-square-foot average. Of course, the larger the unit, the less parking needed, but units that size would almost have to be condo, and condo money is very hard to get from a bank. Preston Place has two acres with half theoretically allowing 240 feet on Northwest Highway and 96 feet on the northern half of their lot. 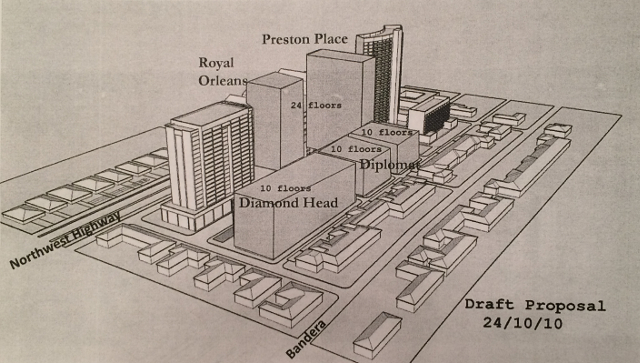 So double Royal Orleans’ math and you still don’t likely get a high-rise. Sure, they could pile all of their 180 units on the front, but no developer is going to build what would be an expensive building and leave half the lot as parkland. As you can see above, one city scenario (green) showed two buildings split in half. But even that I think is a generous possibility. If the back building is assumed to have 90 units there’s no way the front taller building can also have 90 units. There’s too much of a volume difference unless the units on the Northwest Highway building would be a heck of a lot larger than those on the back. The city did not share if any rough calculations of unit sizes went into their overall envelope calculations. I suspect not, but I don’t know for sure. And remember, I’m not afraid of height. I’m the one who thinks one fabulous building would be a game-changer for the neighborhood. So while I’d love to see a 240-foot-tall starchitect building, I just don’t see it. There were plenty of other parameters suggested for PD-15, but height always seems to be the bugaboo. If you want to see the city’s deck, you can download it here. The committee members behind the 10-6-4 plan that I took to the woodshed two weeks ago was presented. Many kept calling it a “compromise.” A compromise is when something rests between “bare minimum” and “overboard.” My new analogy involves a snowman. The 10-6-4 draft is like offering to build a snowman on a 70-degree day. However, there is no snow to build the snowman above 32 degrees. Saying 70 degrees is a compromise from 80 degrees isn’t an actual compromise because you can’t build a snowman above the freezing point of water. The same is true of development. It’s not a compromise unless it’s buildable, and 10-6-4 isn’t. It’s a collection of boxes with no volume calculated, no unit counts, not financeable, and no one saying they’d build it. It makes assumptions that sound good, but the city would be powerless to implement. It’s a 70-degree snowman. 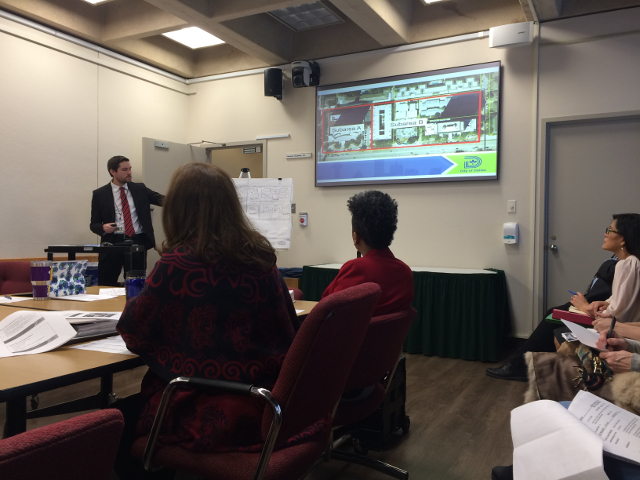 The noisiest comments came from Preston Hollow residents who’d seen Provident Realty present to the Preston Hollow East Neighborhood Association last week. 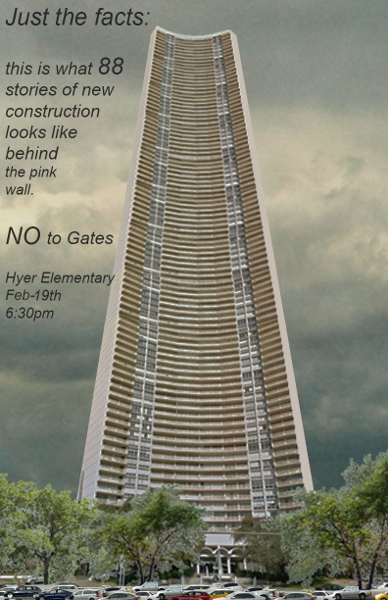 They and their architect showed up with a 38-story building containing 320 units that many claimed the city supported. Council member Jennifer Gates spent too much time quelling nerves. There is no effing way a 38-story building will be built in PD-15. That would be over 400 feet tall, placing it in the top 30 tallest buildings in Dallas – just slightly shorter than the Renaissance Hotel on Interstate 35E and the W Hotel in Victory Plaza. At 160 units per acre it would be 60 percent more dense than the city wants. Provident has a habit of throwing crap against a wall and seeing what sticks – unfortunately, residents have no way of knowing that. All that tone-deaf tactic did was inflame the situation. 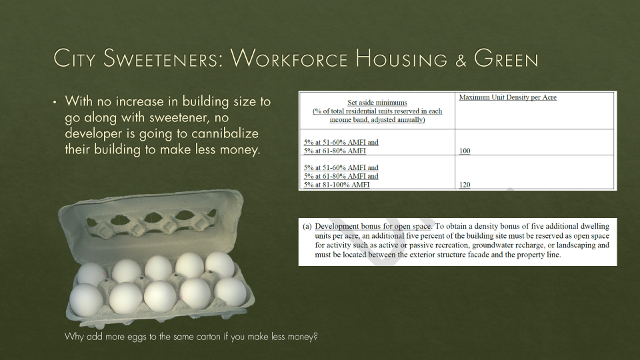 A few concerns popped up about the city’s density-based affordable housing sweeteners. More than a few pulses raced judging from the mummers of “no” heard through the room. There were a few odd comments wanting to know if there were limitations on the ages of new residents. No, said the city. Two speakers were alarmed that people with children could move in next door to a retiree. (Now we know why the grandkids don’t visit). Behind me I heard someone respond to the kids concern by saying “black kids” which seemed to be combination racism when coupled with the affordable housing comment. In a laughable moment, a Preston Tower resident said they’d distributed a survey to everyone whose email they had. Really? Everyone? I didn’t get one and I’ve got the biggest mouth in the area. My email is listed on every column I write and is well-known to the “no” committee he touts. And yet both he and Laura Miller make hay with the amount of support they have. The rank and file have not been educated nor polled. The HOA boards have likely just allowed their entire building to be represented by this group – and their residents can do little to stop them. I know. They don’t represent me and my HOA won’t give me a vote. Laura Miller raised the issue of her Preston Road and Northwest Highway Area Plan and why all the money spent on research had been cast aside so quickly (cheers erupted from the audience). It’s a simple answer. Task force members (including plan co-author Peter Kline) told me that Miller and the task force tossed the research in favor of their own self-written plan that essentially wrote down whatever task force members dictated. If you don’t believe me, read the plan here. You’ll note that anything to do with the hard recommendations for density and usage (that, for example, encouraged mixed-use with less focus on office space in Preston Center) are not in the report (graphic above). All the 3-D imagery and potential scenarios were left out. So aside from it having no economic backing, Miller presided over a plan with no data. (Note: I am not implying the consultant’s data was easy to digest or perfect – I gave it hell when it was happening – but it was better than the nothing that was delivered). Returning to the other comments, a Preston Hollow resident lamented that they’re coming very late to this party and why there wasn’t better notification. I’ve said on multiple occasions that it’s hardly been a secret for the past two years. But there’s another, deeper answer and it involves ever-shrinking newsrooms across the country. I was happy to see a Dallas Morning News reporter at last night’s meeting, but it’s a rarity. Had candidate Miller not been there and fireworks expected, I’m not sure DMN would have shown. Local news coverage is evaporating before our eyes. Another comment was a fearful cry about PD-15 being a first domino in remaking the entire area into West Village. Nope. First, PD-15 is unique, and in my opinion the only real chance the Pink Wall has at modernization. The rest of the properties are deed restricted to their current two-story build-out. Should the restrictions be lifted (a high bar) their underlying zoning is MF-1, allowing just three stories. There are literally no other dominos to fall. Once the four low-rises are rebuilt (most likely as mid-rises), barring catastrophe, they’re there for the next 30-plus years. Finally, one Preston Hollow resident said the most truthful thing of the evening. He told the packed house that when be purchased his home, the towers didn’t matter to him. He continued that when he sells, the towers and whatever is built in PD-15 will not be a concern to him either. 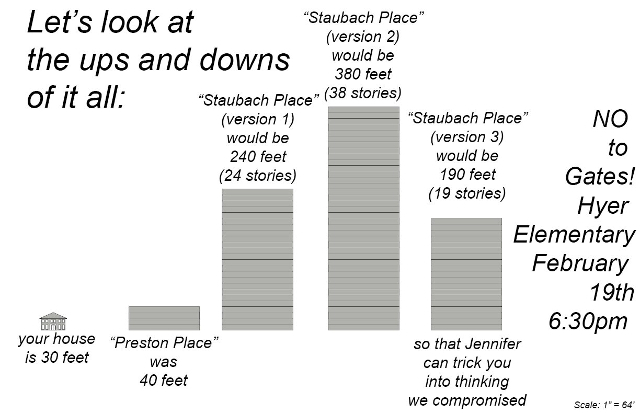 Let’s assume you live in a three-story, 30-foot-tall home (most don’t) and that Preston Place was indeed 40 feet tall. 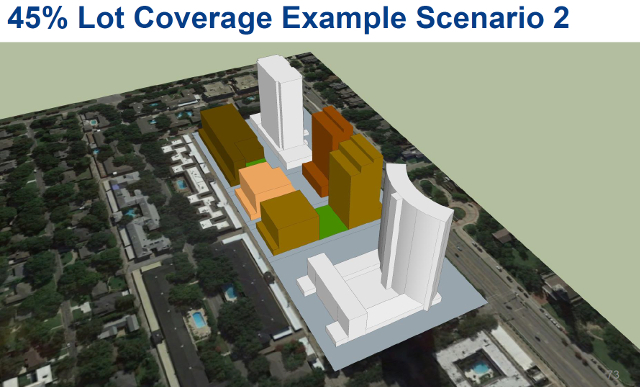 “Version 1” above is the height of a building along Northwest Highway that met the residential proximity slope the city is recommending in their draft. The current zoned height limitation is infinity. So even if 240 feet was likely, it’s still quite a reduction. But they’re also recommending 90 units per acre, which would produce units starting somewhere around 1,500 square feet. No one in Dallas is building that kind of structure. A.G. Spanos’ proposal is for roughly 115 units per acre delivered in seven stories. It’s math. And that’s just parcels along the front of Northwest Highway. The northern parcels drop to 96 feet in height. Again, not the existing infinity – and not the 85 feet being proposed by A.G. Spanos for the Diplomat lot. On these parcels the proximity slope actually allows a taller building (~120 feet). 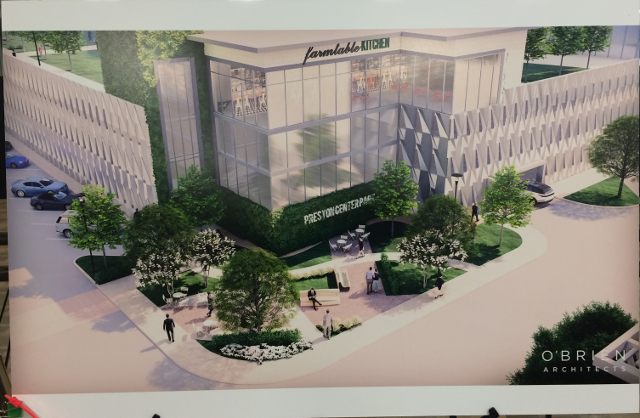 “Version 2” reflects a proposal by Provident Realty that was first seen at last week’s Preston Hollow East Neighborhood Association. The city had never seen it, council member Gates had never seen it, plan commissioner Margot Murphy had never seen it – I asked them – something the author of this email didn’t. It will never be built. Provident is famous to me as a developer who throws up ludicrously-sized renderings to see what they can get away with. “Version 3” is similarly not a real plan. No developer has presented a 19-story building. The “compromise” is simply made-up. 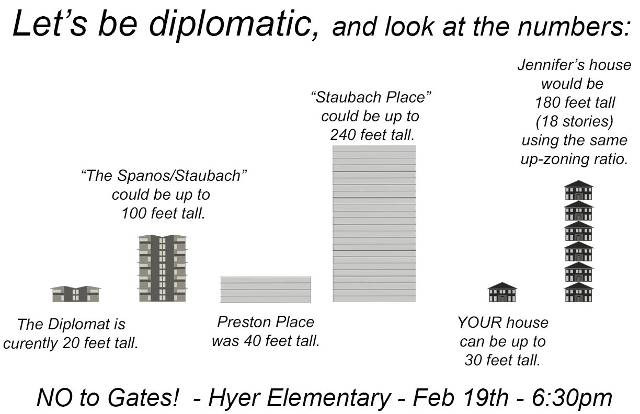 Oh, haha, “diplomatic” because one of the buildings is the Diplomat. More misleading graphics. “Spanos/Staubach” is (and always has been) 85 feet tall. “Could be” isn’t on the table. It’s scaremongering. The 240-foot tall “Staubach Place” would sit between two towers of similar height, an irony lost on residents of the 21-story Athena and 29-story Preston Tower. Council member Gates home is located in a single-family neighborhood. The Pink Wall was originally zoned commercial. 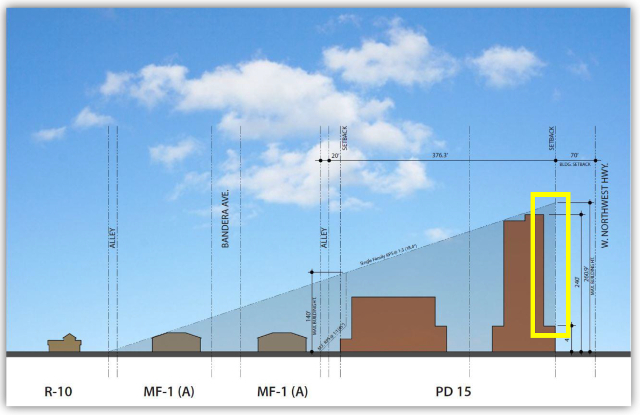 When PD-15 was created in the 1960s, its base zoning was MF-3 – unlimited height. It’s not even apples and oranges, its apples and elephants. Will something 240 feet in height be built with the density limits? Who knows? No one has come forward with a credible proposal. You read “California developers,” which this “Illinois writer” translates as misplaced Texas exceptionalism. A.G. Spanos are based in California, but their local executive lives in Preston Hollow. 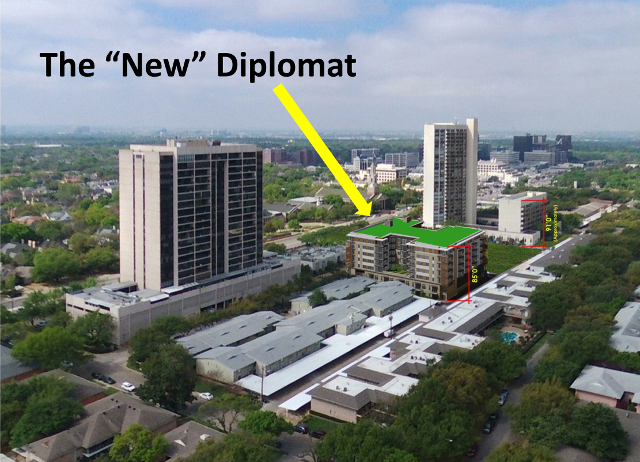 And it’s not their 85-foot proposal for Diplomat that should be the most worrying. The uncertainty of the other lots (with and without developers) should be of far more focus than Spanos’ known quantity – whether you support it or not, uncertainty is always worse. I have no idea if this is accurate, but it’s certainly misleading (shocking, right?). Which shadows are from existing buildings and which aren’t? Preston Place is shown as a high-rise front to back (which the city isn’t recommending). 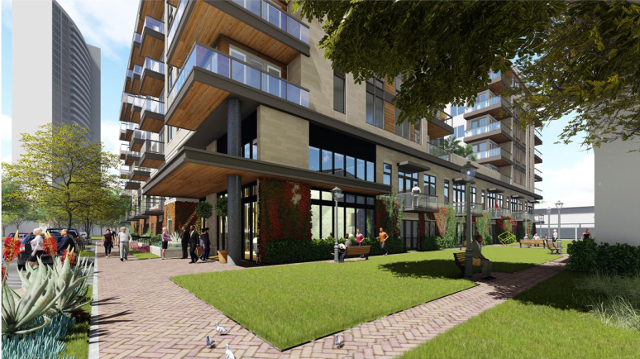 Royal Orleans is also shown as a high-rise, a configuration that is nearly impossible to build on their tiny lot. You’ll also note this projection is based on Dec. 21, the shortest day of the year, but also when the sun is at its lowest and producing the most shadow. Literally the worst day of the year. Use June 21, the date of the longest sunshine of the year, and the shadows are completely within University Park. I saved the best for last. First, I’d hope an 88-story building wouldn’t look like such a dump. Secondly, it’s more misdirected propaganda (of course). Preston Tower contains 85 units per acre but it’s spread over four acres. So yes, this may be what 88 stories of Preston Tower would look like, but it’s as illustrative as piling a block’s worth of single-family homes on one lot. Yes, it’s tall, but the rest of the block would be pasture. It’s simply taking a concept to absurdity. “Absurdity” has always been a great word for political campaigns. Yes, the neighborhood should have been paying attention to the two-year process of figuring out what to do with PD-15 since Preston Place burned. But they weren’t. Now that pen is meeting paper, the propagandists are out in full force. Their all-too-easy goal is to incite the uninformed angry mob who’re so many political pawns in a game that’s not really about them. In January, nearly 100 neighbors interested in Planned Development 15 packed the Walnut Hill Recreation Center community room. The PD-15 area is located north of West Northwest Highway between Pickwick Lane and Baltimore Avenue and encompasses six condominium complexes. At issue: What will become of the condos now after one complex burned down? What are the height restrictions? What’s the grand vision for redevelopment? Millions of dollars are at stake. City Council member Jennifer Staubach Gates told the crowd that she’d like for recommendations to be ready by March given that the last committee couldn’t come to a resolution. Why should neighbors care about what seems like a difficult-to-understand issue? If you care about traffic and Northwest Highway development, here’s what you need to know about PD-15 before the public meeting Feb. 19, 6:30 p.m. at Hyer Elementary Cafeteria, 8385 Durham. What is a planned development? It establishes planning and zoning regulations for an area of land. PD-15 was established April 23, 1947, and includes approximately 14.2 acres. Why a PD-15 steering committee? Preston Place burned down in March 2017. The city immediately created a study group, which ultimately couldn’t come to an agreement about how to develop the area. In April 2018, at a community meeting, Gates invited citizens to apply to be on a new steering committee. Who’s on the new PD-15 steering committee? How much traffic will development bring to PD-15 and surrounding streets? How high should the buildings be? How much do you care about being able to walk to Preston Center? 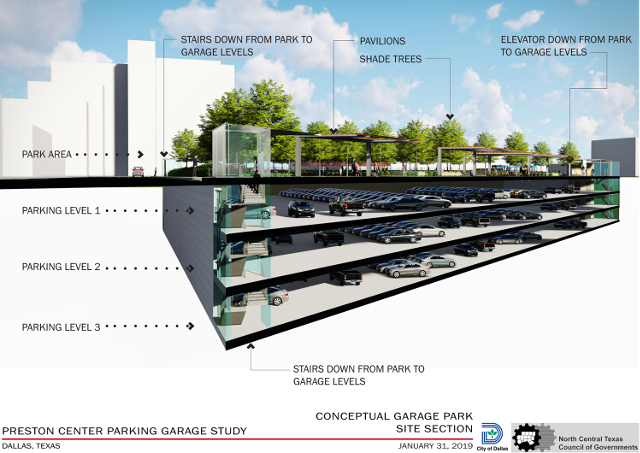 Are you concerned about underground parking? What about flooding and water flow management? What has the new steering committee been doing? 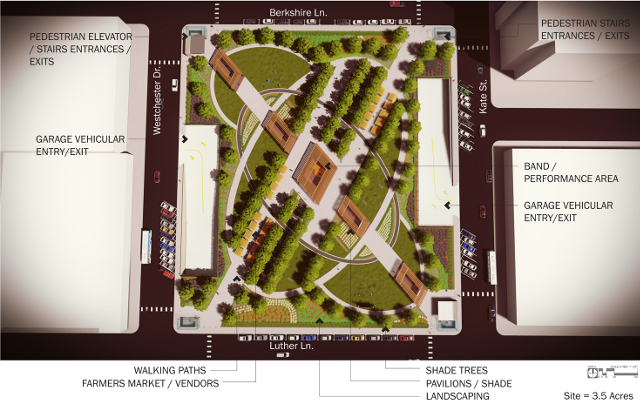 Wilkins, desiring an urbanist’s counsel, invited architect Michael Friebele at Callison RTKL to offer a concept. The Friebele concept: “One idea, and you build the whole thing.” Sources won’t allow us to publish a map of the concept, but the idea is for architects to design one concept for all properties, suggesting no more than 10 stories on Northwest Highway and four stories on the north side. Here’s what owners at all condo properties want, according to Wilkins: plenty of green space and walkability; high rises on the south, low rises on north. Ask questions. Contact Andrew Ruegg, at 214-671-7931 or andrew.ruegg@dallascityhall.com. Attend the public community meeting Feb. 19, 6:30 p.m., at Hyer Elementary Cafeteria, 8385 Durham. And of course these folks are all in a tizzy with what’s been going on without them. Many were the same faces opposed to The Laurel on Preston Road and Northwest Highway. Accusations are flying back and forth, open records requests are being filed to get ahold of communications between PHENA president and PD-15 committee member Juli Black and city officials (below). These residents seem to want the train to stop while they get caught up. This is the point at which I hate zoning cases. Everyone does the best work they can and then back-seaters suddenly get riled up to stop the presses because they’re … them. It’s easier and more grand to upset an apple cart that someone else has grown, picked and placed in the cart. Last night, a hastily called PHENA meeting attracted some 80 residents and interested onlookers. Here’s what went down. The first 45 minutes of the meeting centered on walking attendees through all the communications that have gone on between PHENA and residents. Essentially it built the case laid out above that even death wouldn’t really excuse the neighborhood of not knowing what was going on. The remainder of the meeting saw the two known developers showing their proposals. The A.G. Spanos team showed their vision for the Diplomat parcel while Provident’s Mark Miller showed an updated vision for Preston Place. Attendees queried after the meeting were pretty OK with Spanos’ project but were aghast with Provident’s ever-growing project. All communications (letters/memos/emails/text messages) between Council Member Jennifer S. Gates, her staff, or anyone acting on their behalf and Juli Black relating to PD-15, the formation of a steering committee relating to PD-15, and/or any proposed development within PD-15. All communications (letters/memos/emails/text messages) between City Plan Commissioner Margot Brito Murphy, her staff, any staff members of the Dallas Plan Commission, or anyone acting on their behalf and Juli Black relating to PD-15, the formation of a steering committee relating to PD-15, and/or any proposed development within PD-15. All communications (letters/memos/emails/text messages) from Jan. 1, 2017 to the present between Council Member Jennifer S. Gates, her staff, or anyone acting on their behalf and anyone employed by or affiliated with any real-estate development company relating to PD-15, the steering committee relating to PD-15, and/or any proposed development within PD-15. All communications (letters/memos/emails/text messages) from Jan. 1, 2017 to the present between City Plan Commissioner Margot Brito Murphy, her staff, any staff members of the Dallas Plan Commission and anyone employed by or affiliated with any real-estate development company relating to PD-15, the steering committee relating to PD-15, and/or any proposed development within PD-15. All documents, internal or external (including electronic communications) relating to an April 22, 2014 Dallas Observer news article entitled “In Preston Hollow Apartment Case, Staubach Gates Takes Recusing Herself to a New Level.” This request shall include any communications between Plan Commissioner Margot Brito Murphy or her staff and City Council Member Jennifer S. Gates or her staff. This is a pretty big net that seems to be attempting to make connections between The Laurel, PD-15, and its cast of city hall characters. What’s interesting is the request includes current PHENA president Juli Black while not seeking the same information for PHENA board members in The Laurel case. Hmmm. Is it credible for PHENA residents to again claim ignorance of communication? I can’t imagine anyone involved with the two-plus years spent on The Laurel dropping the ball so soon. Surely anyone who cared about development had signed up for any communication from both the city and PHENA? Surely at least one of this similar group knew and spread the word. In my experience, protesters don’t hide their lanterns under a bush. It’s hard to believe an accusation of a willful obscuring of the events within PD-15 can be credible given the amount of communication. However, there may be significant disagreement about the level of redevelopment Black supported. During committee meetings, she was an indulgent counterweight to the towers’ “do nothing” approach. Not all PHENA residents will be thrilled by her generosity of vision. These structures’ proliferation is one of the most dramatic changes to the country’s built environment in decades. Yet when I started asking around about them, they didn’t seem to have a name. I encountered someone calling them “stumpies” in a website comment, but that sadly hasn’t caught on. It was only after a developer described the style to me as five-over-one—five stories of apartments over a ground-floor “podium” of parking and/or retail—that I was able to find some online discussion of the phenomenon. In the U.S., stick framing appears to have become the default construction method for apartment complexes as well. The big reason is that it costs much less—I heard estimates from 20 percent to 40 percent less—than building with concrete, steel, or masonry. Those industries have sponsored several studies disputing the gap, but most builders clearly think it exists. They can also run to the nearest big-box store to find workers. Stick construction allows builders to use cheaper casual labor rather than often-unionized skilled tradespeople. And it makes life easier for electricians, plumbers, and the like because it leaves open spaces through which wires, pipes, and ducts can run. Still, there’s a reason why stick wasn’t the default for big apartment buildings until recently, and why these buildings are limited in height: Sticks burn. It was the Great Chicago Fire of 1871, which destroyed thousands of balloon-frame buildings, that brought this lesson home. Before long, the city instituted a ban on wood construction that’s still partly in place today. New York City had declared its downtown off-limits to wood construction in the early 1800s, eventually extending the proscription to all of Manhattan, plus the Bronx, Brooklyn, and parts of Queens and Staten Island. By 1930, a list of fire-resistance best practices compiled by the U.S. Department of Commerce was recommending stick-frame bans in dense urban neighborhoods and a two-story limit for everywhere else. Stick construction had effectively been banished to the suburbs. By the second half of the 20th century, the suburbs were where America was moving, and as they evolved from bedroom communities into a new kind of city, the stick building evolved with them—into forms such as the “dingbats” of Los Angeles (one or two stories atop a carport) and the parking-rich garden-apartment complexes outside Atlanta, Dallas, and other metropolises. Building codes evolved, too, as insurers and fire-safety-equipment manufacturers pushed for scientific, “performance-based” codes that emphasized lab-determined fire-resistance ratings over specific materials and incorporated new technologies such as the automated fire sprinkler. This gospel spread fitfully in a country where codes were a municipal affair, but it did spread, abetted by three regional organizations that produced model codes for cities to adopt or adapt to their own purposes. The most successful body was the aspirationally named International Conference of Building Officials, based in Southern California, whose Uniform Building Code was by 1970 at least partly followed by 9 in 10 Western cities. The UBC, updated triennially, ushered in the age of the mid-rise wood-frame apartment building. Some of the details are lost in the mists of time, or at least in dusty archives, but the tale seems to have gone like this: The first UBC, issued in 1927, allowed for wood-frame apartment buildings three stories high. The risk of earthquakes inclined officials to be tolerant of such frames, which handle shaking better than brick walls do; the presence of a large timber industry in the Northwest was also a factor. In the 1950s the story limit increased to four if an automatic sprinkler system was installed. Square-footage restrictions were eased if building segments were separated by firewalls—initially masonry, then simpler-to-install gypsum board. By the 1970s it was possible to build four wood-framed stories atop a concrete podium. Then, in the early 1990s, came a breakthrough. Los Angeles architect Tim Smith was sitting on a Hawaiian beach, reading through the latest building code, as one does, when he noticed that it classified wood treated with fire retardant as noncombustible. That made wood eligible, he realized, for a building category—originally known as “ordinary masonry construction” but long since amended to require only that outer walls be made entirely of noncombustible material—that allowed for five stories with sprinklers. His company, Togawa Smith Martin Inc., was working at the time with the City of Los Angeles on a 100-unit affordable-housing high-rise in Little Tokyo that they “could never get to pencil out.” By putting five wood stories over a one-story concrete podium and covering more of the one-acre lot than a high-rise could fill, Smith figured out how to get the 100 apartments at 60 percent to 70 percent of the cost. The building, Casa Heiwa, opened its doors in 1996, and the five-over-one had been invented. (“Let’s put it this way,” Smith says. “No one has challenged me to say that they did it first.”) The public didn’t take note, but West Coast architects and developers did. They could now get near-high-rise densities at a wood-frame price. Soon, the rest of America could, too. Despite the regional groups’ efforts, many architects, developers, economists, and federal housing officials still found local codes parochial and backward-looking, charging that they thwarted innovation and inflated costs. One response came from legislatures, which began increasing state authority over codes. Another came from the regional groups, which in 1994 started work on a single national code. Faced with a major challenge resolving differences over building heights and areas, the responsible committee settled on a somewhat radical precept: If a building could be built under any of the three old codes, it could be built under the new one. Under the 2000 International Building Code (IBC), the stick-built mid-rise podium apartment building was free to migrate eastward. The need for scale dictates hulking “superblocks,” and the desire to break up these blocks a little explains the colorful panels and other exterior choices. Efficiency dictates the buildings be wide enough for “double-loaded” corridors, with apartments on both sides, but not so wide that the apartments are narrow and dark. This in turn favors a structure shaped like a right-angled U, C, E, or S. Two- or three-bedroom apartments work best at the corners, so one-bedrooms and studios predominate. The boom has also been shaped by zoning that sometimes leaves downtowns and suburban commercial districts as the only practical spots for new housing. 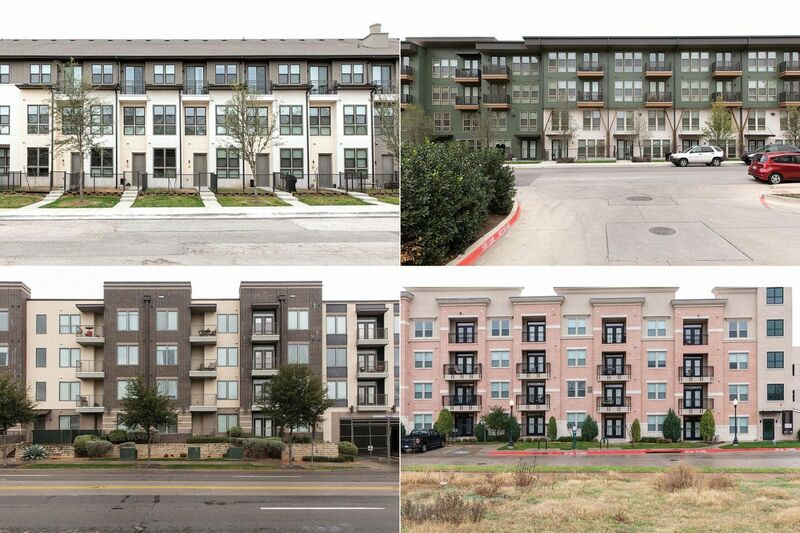 Ordinances requiring a minimum number of parking spaces per apartment unit factor in, too: Where minimums are relatively high, as in Texas, the best solution can be wrapping the building around a parking deck, a style known as the Texas doughnut. Where they’re lower, the ground-floor podium will do. City planners also often require developers to devote street-front podium space to shops and restaurants. Yes, the result can be a little repetitive, but repetition has been characteristic of every big new urban or suburban housing trend in the U.S. over the past century or two. There’s lots to like about stumpy buildings that provide new housing in places where it’s sorely needed and enliven neighborhoods in the process. 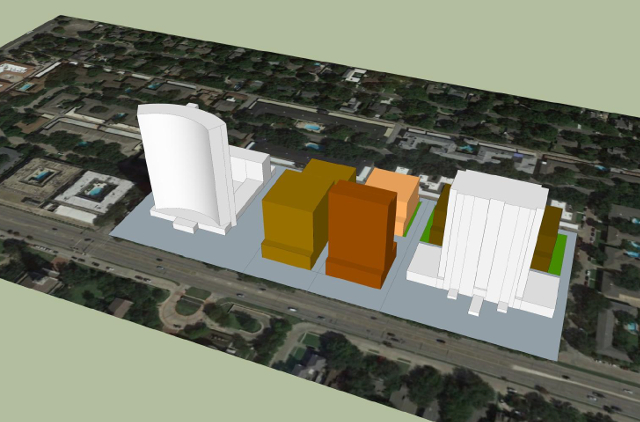 A four-story Texas doughnut can get 50 or 60 apartments onto an acre of land, while the most aggressively engineered West Coast stick-and-concrete hybrid (two-story podiums are allowed now, along with other variations) can get almost 200. That’s not far from the range that the renowned urbanist Jane Jacobs deemed optimal for vital street life. There’s also lots to like about building with wood, which, as long as the trees are replanted and allowed to grow to maturity, is now generally accounted to be a net consumer of carbon dioxide. Wood’s green credentials have helped spur a recent worldwide push for more construction with “mass timber”—softwood lumber glued together and compressed into thick beams, columns, and panels. The tallest such structure completed so far is an 18-story dormitory at the University of British Columbia, in Vancouver. Oregon has already changed its code to allow mass timber buildings of that scale, and the 2021 IBC is set to do the same. There haven’t been many such fires in completed stick mid-rises, but the buildings have proved highly flammable before the sprinklers and walls go in. Dozens of major fires have broken out at mid-rise construction sites over the past five years. 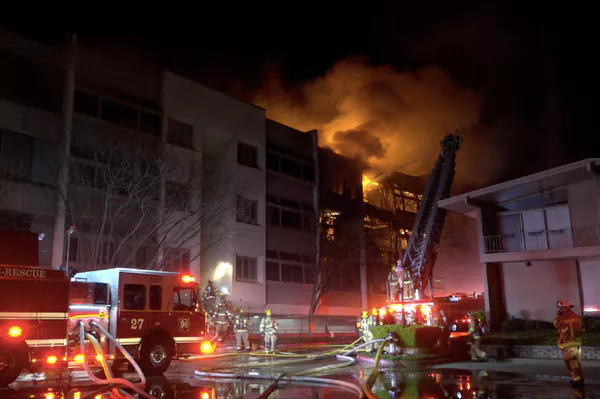 Of the 13 U.S. blazes that resulted in damages of $20 million or more in 2017, according to the National Fire Protection Association, six were at wood-frame apartment buildings under construction. These fires often bring a local outcry to restrict stick apartments. The Atlanta suburbs of Sandy Springs and Dunwoody enacted bans on wood-frame buildings above three stories, but they were later overturned by the Georgia legislature. There’s also talk of new regulations in Los Angeles, Philadelphia, Massachusetts, and Maryland. But the place where legislative action seems most likely is New Jersey. The toughest of the bills before New Jersey’s legislature would restrict urban stick buildings to three stories and 7,000 square feet per floor. Proposals with a better chance of passing call for, among other things, masonry firewalls between building segments and full sprinkler systems for apartment buildings three stories and higher. The Avalon at Edgewater has been rebuilt with these measures; Feigin, construction chief for AvalonBay, the building’s owner, says they’re now standard for all the company’s new mid-rise developments. The 2018 IBC adds provisions aimed at stopping fires from spreading through apartment-building attics, and a proposal approved late last year, over the objections of builders and apartment owners, will change the 2021 code to effectively require full sprinkler systems for all four-over-one podium buildings. Then again, the reason the ICC exists is because setting building codes locally came to be seen as not really in the public interest, either. Deaths in residential fires in the U.S. are down by almost half since the 1980s, so something appears to be working. And there are echoes in at least some of the agitation of standard-variety Nimbyism. Some parts of the country need lots of new housing, and builders of bulky mid-rise wood-frame apartment buildings have found an economic formula that provides it. Whether it’s the right formula for American cities is something we’ll have to wait to find out. —Fox is a business columnist for Bloomberg Opinion. Another “praiseworthy” item was the Preston Road and Northwest Highway Area Plan. Many believing it to be a gold standard of biblical proportions, when it’s closer to manure. I mean really, what do you call a plan that purports to guide development that has no underlying data supporting the economic viability of its conclusions? 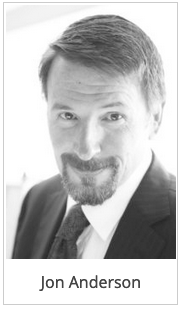 How about when co-author Peter Kline told me, “To call it a plan is an overstatement”? Another way to gauge its credibility would be if the consultants, paid to provide data, stood behind its conclusions. Comparing their (left out) recommendations with the final plan, that endorsement will never come. Don’t believe me? Check out my D Magazine story that dismantles it. The graphics shown displaying the city’s draft PD proposal were inaccurate (lead story graphic). The cries of the process being developer-led ignore the fact that the one developer who’s come to the table (A.G. Spanos for Diplomat) is actually asking for a shorter building than the city’s proposal. A shorter building, it should be noted, precisely where lower matters. The trope about developer greed seems to call for non-profit developers to step forward. The continued red herring of the 100-foot setback on Northwest Highway was again rolled out as being something to fear simply because the city’s draft calls for 70 feet. What they ignore, or have been kept in the dark about by their HOAs, is that documentation exists in multiple locations dating back to 1945 that supports the 100-foot setback. This evidence includes a contract signed in 1966 between all the Northwest Highway landowners that states no changes can be made without unanimous approval. Done and dusted, but the drone wears on and the rubes still get whipped up. The plan known as 10-6-4, which reflects the stories proposed as a “compromise” by some of the committee members is shown above. It’s wholly unworkable. On the back side, four stories are not economically viable to build and even if someone agreed to build that height, the resulting build quality would be on par with The Laurel mentioned above. The 10 stories outlined for Northwest Highway are similarly unbuildable. Hybrid construction enables buildings up to eight stories, after that, it’s concrete and steel, which raises the build costs by 30 to 35 percent. No one is going to incur that cost for a measly two stories. As you can also see, the plan seems to think all the low rise properties are owned by one owner. They’re not. No bank will loan on a project that’s physically connected with other owners’ property. BUT the biggest folly of all is a one story concrete plinth under the whole thing. Part of it would be parking while maintaining Tulane Avenue running underneath through a ground-level tunnel. If the buildings themselves are not economically viable or financeable, there’s no way anyone would pay to essentially jack their buildings up over an enormously expensive shared concrete slab. This group has presented their plans to developers, architects and others and have been told exactly what I’ve outlined here, namely that its UN-buildable. And yet they persist. 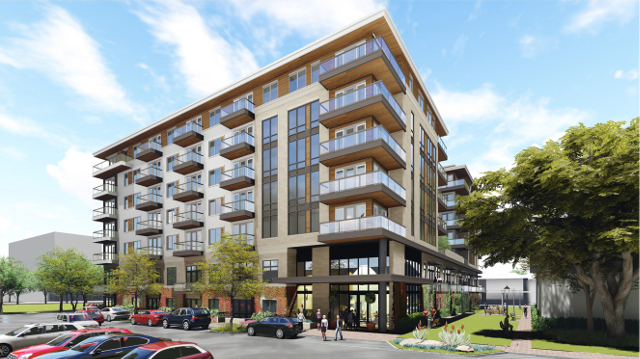 Their plan calls for units 1,600 to 3,000 square feet – much larger than neighborhood averages. 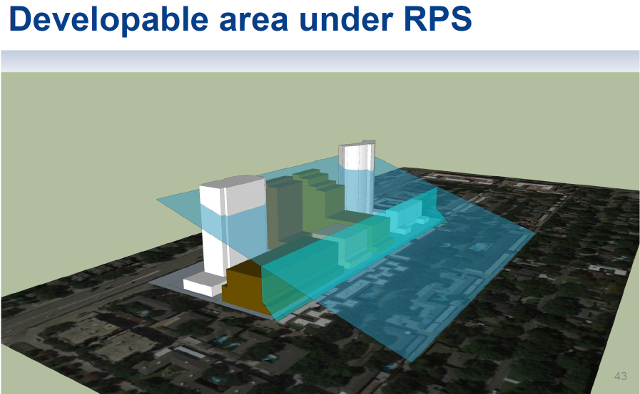 What they seem to forget is that larger units equal larger buildings. 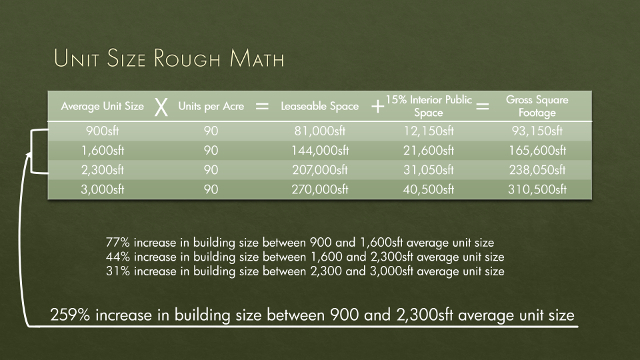 Shown above, you can see what happens if unit size increases and the units per acre are stable. Regardless of whether it’s 90 units per acre or whatever, the percent increase in building size stays the same. For people hell bent on keeping buildings short, this makes no sense. Behind the scenes, it is sadly even funnier. While tonight they said it would be all residential, the plan they presented to me (yes, to me) included a coffee shop that’s a pet project of one committee member. This same committee member told me the only reason they settled on 10 stories on Northwest highway is because another committee member’s condo was on the 11th floor and she didn’t want people looking in. Oh, and that same committee member’s friend’s relative drew up the plan – not a licensed architect, never built a building in his life. They couldn’t even tell the group how many units it would contain – it’s just a picture thrown together by people who don’t know what they’re talking about. They call it a compromise, but it’s only a true compromise if it has a hope of working. It’s like offering a naked person a sock … sure, it’s clothing … but not enough to keep from being arrested. Water intrusion at 3-year-old Bandera apartments. Prediction: If the 10-6-4 plan is actually built, residents will spend the rest of their days bitching about the low building quality and blaming everyone else but themselves. 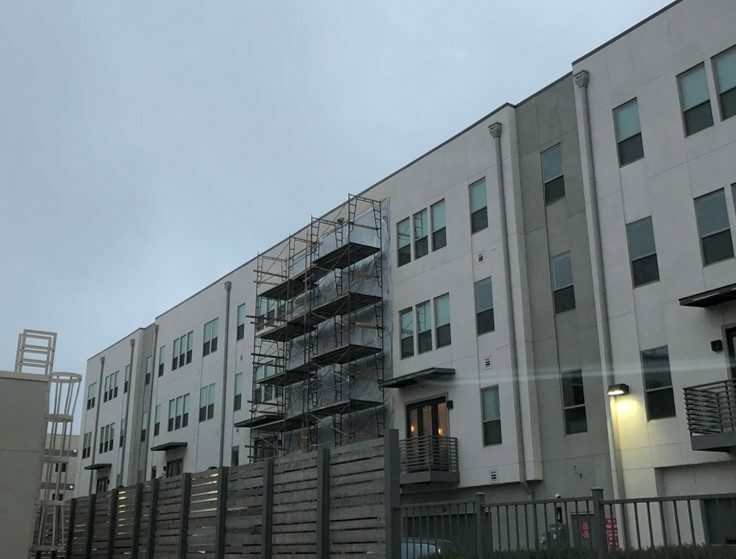 As I also pointed out, the 3-year-old Bandera apartments have already been repairing leaks to their stucco exterior. It’s worth noting that former Dallas Mayor Laura Miller was there, and I can say it’s the first time I’ve ever seen her at an Athena meeting in over five years. As expected, she tried to attack Council Member Gates on a number of topics. Gates defended herself pretty well. There was a fearful question about the city’s inclusion of sweeteners for developers offering affordable housing. Nothing gets people who think they’re wealthy in a knot like people who know they’re not rich living nearby. As I tried to point out – no one is going to build them the way it’s stated. The city is offering increased density (units per acre) in exchange for affordable units. But there’s no increase in the buildable envelope. So as you can see above, if you’re selling a dozen eggs for $3 and someone says you can sell 14 eggs in the same size box for the same $3 (or less), why would you? It’s a bad deal. 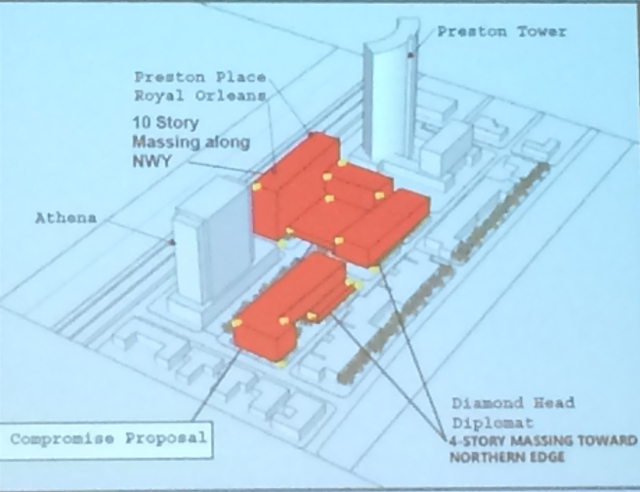 After the meeting, one Preston Tower resident tried to convince me that the 10-6-4 could be built. My response was that the rents would be too high for the neighborhood to bear. His flip answer was “we’ll see.” But we don’t have to wait that long. 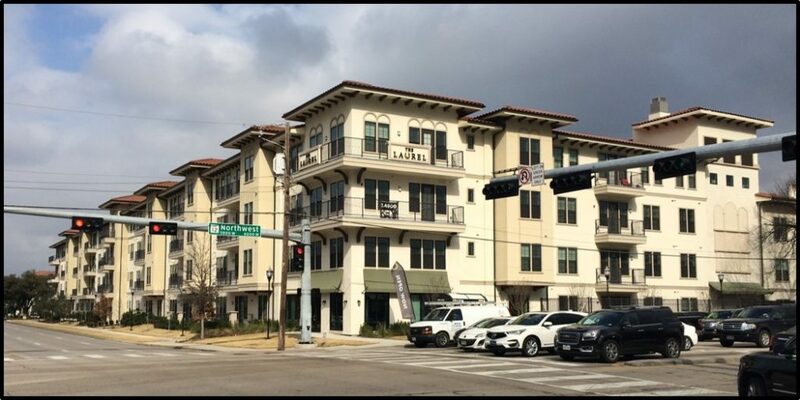 The Laurel apartments have been for lease since May 2018 and are reportedly 22 percent occupied. That’s a failure. But the neighborhood is so unthinking that they can’t even understand that one way or another, those units will be rented. Butts in beds will win and so the quality of tenant will decline with rent decreases or perhaps advertising for higher-density roommate rentals who split the costs and fill units. And of course, you had those who think nothing should be done. 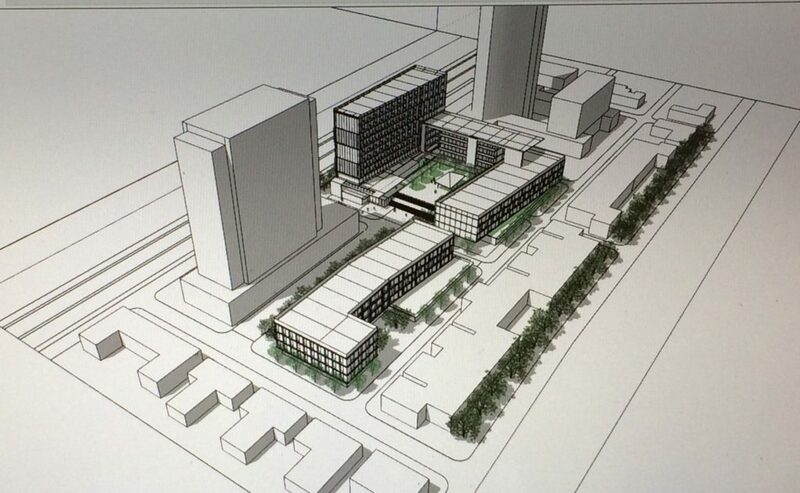 Preston Place should be a burned-out concrete platform and no other building should change. Whatever makes these people think that repeating the Laurel mistake with the same crew of “negotiators” will achieve a different outcome is beyond me. The only answer I can come up with (that’s printable) is that they are grossly uninformed and have no desire to step outside of their bubble to learn – while reserving their right to complain if they actually get their way. Regardless of what’s built underneath it, the park is estimated to cost between $7 and $8 million. It’s certainly more than a few Home Depot runs. The big number is the garage itself. The Walker folks had three scenarios based on different levels of parking. To build 1,005 spaces across three underground levels would cost between $30.7 million and $36 million. The 1,005 number was arrived at by assuming all the existing surrounding buildings were 100 percent occupied and calculating their needs. That brings a total between $37.7 and $44 million for the underground garage and park. That’s a lot of money right there. But remember, the project has $20 million already earmarked ($10 million each from the last bond and NCTCOG). So glass half full. Next up they tackled 1,200 spaces also on three underground levels which came in between $34 .2 and $40 million. That’s an increase of between $3.5 and $4 million for the additional 195 spaces. Those spaces are breathing room for future needs and easier parking today. Total with park is between $41.2 and $48 million. The half-full funding glass is now slightly less. The Preston Road Area Plan called for a doubling of the existing garage to 1,600 spaces. Essentially tons of extra parking that might not be used until a ubiquity of self-driving cars. But, this is supposed to be a solution for the ages, so it’s worth considering. The problem is that 1,600 spaces spills into a fourth underground level which really jacks the price. The parking would cost between $49.6 and $54.5 million, an increase of roughly $15 million over 1,200 spaces. The grand total here with the park is between $56.6 and $62.5 million. At this level, our $20 million in funding is about one-third of what would be needed. Now’s the time for smelling salts. First we get rid of the existing eyesore. We get an area where folks can sit in the grass, order takeout from a nearby restaurant and maybe visit a farmers’ market or art fair. There might be some splashy things for kids to run through in the summer. All sorts of things besides an unsightly garage. I hear you saying, “That’s all well and good, but is any of it bankable?” Yes. According to Walker Consultant’s research, properties surrounding similar types of amenity parks appreciate on average $80 per square foot. Selecting a random low-rise property on the southern, Luther Lane side of the garage, DCAD shows the property is valued at $251 per square foot. An $80 per foot increase would amount to a 28 percent increase in value. That would not only increase city tax rolls, but also rents because of the improved desirability of the property. It would bring them more in line with those collected across Preston Road at The Plaza at Preston Center. Most things in life are a combination of time and money. Walker Consultants estimate 29 months from first shovel to ribbon cutting. That’s a long time to interfere with the functioning of a shopping center. I suspect it’s at the top of the list of why area landowners are against this plan. And I get it. Rents will temporarily go down (before recovering and quickly increasing). My question. Would area landowners support this plan if instead of the single shift of work outlined here, work was around the clock? If 29 months were halved to 15 months. Speeding up construction will add to costs, but we’d already need to save to afford this anyway, and it is absolutely the right answer for Dallas, and ultimately the landowners (even if they refuse to see it today). Landowners’ plan: Cover the lot. Double dip, triple dip, stuff your whole head in the trough — the landowners came up with their own plan. In a nutshell, cover the entire acreage in a combination parking lot and 300-unit apartment building (or as I call it a larder of new customers). 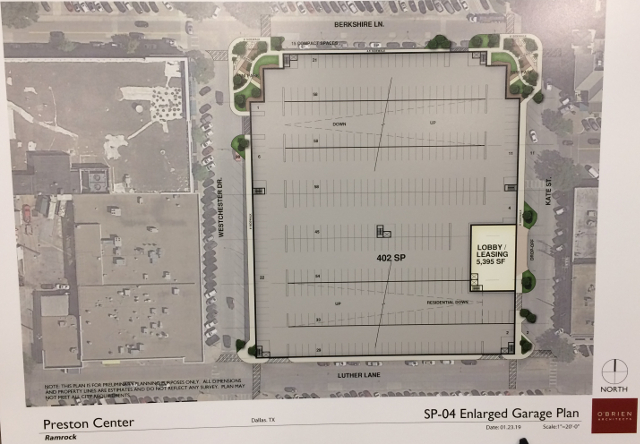 In exchange for providing the parking for their own businesses, they want the city to give them the 3.15 acre site … and the $20 million … and more. To be sure, there would be other monies needed, but the plan calls for the city to be bled dry first. Oh, oh, oh, it doesn’t end there, my friends. Since the landowners require unanimous approval, their chosen developer? Robert Dozier, who purchased Harlan Crow’s Preston Center holdings (after the skybridge debacle) and is now one of the larger landowners. One of their own. Dozier’s response to the city’s plan was more famine, plague, and pestilence than a Sunday red state revival tent. We were told that even after completion the park would scare away customers, businesses would close, and the caliber of business would decline (which wouldn’t happen with their plan, why?). This, said with a straight face, 10 minutes after Walker Consultants said there’d be a 28 percent jump in values. It was eye-rollingly laughable. I mean, surrounding the garage we already have Target, DSW Shoe Warehouse, Office Depot, and Tuesday Morning – nothing in danger of being poached by Highland Park Village. The only way to go is up. Dozier went on to say that their plan would be the catalyst for surrounding landowners to improve and redevelop their own properties. If the landowners wanted the increased rents generated by – oh, I don’t know – the better buildings across the street at The Plaza at Preston Center, they’d have made improvements decades ago. The more likely reality is that their plan would be a silk purse surrounded by a sow’s ear. 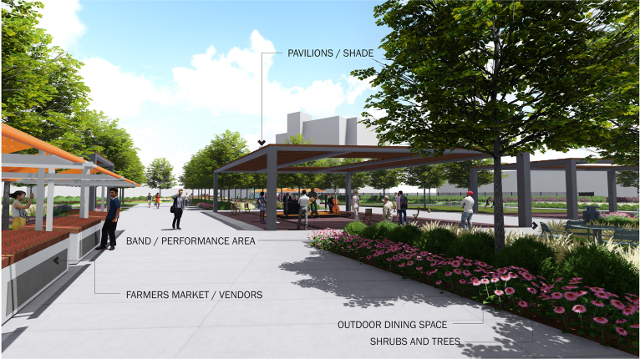 The city’s plan is all about green space and an interactive park to bring vibrancy to the area. Less so the Preston Center landowners’ plan. See the pair of “earmuff” parks on the upper corners? That’s it at ground level – and that pittance was apparently an 11th-hour addition (nawww, really?) to original plans whose green space was only visible when someone dropped a salad. The real green space is on top of the three-story, above-ground parking garage – the part not taken up by the 300-unit apartment tower. Who in the devil’s underpants is going to take an elevator to a raised park more than once? No one. It’ll essentially be an amenity deck for the apartment building. In a bone-toss to usefulness, their plan calls for a small restaurant on the roof to attract folks to the elevator. Fans of Where’s Waldo will be thrilled way-finding the restaurant. I foresee either really, really cheap rent or a never-ending cavalcade of hopeful eateries going bust. Does “out of sight, out of mind” ring a bell here? When the floor was opened for questions, nearly all were directed at the landowners’ plan – most seeing it for what it brazenly is. My favorite was in response to the landowners’ dire predictions. An audience member noted that The Plaza at Preston Center’s underground parking garage (literally across the street) certainly didn’t crater their operation, so why would it harm theirs? You could have driven a truck through the silence. Former Dallas Mayor Laura Miller asked several questions of the landowners’ plan. Each could be tied back to the landowners’ plan’s complete ignoring of the letter and spirit of the Preston Road Area Plan. And she’s right. The landowners used the area plan as so much toilet paper in their haste to print themselves a greedy sweetheart deal crushing any ability to realize the higher monetary and aesthetic potential of Preston Center. Another audience member surfaced the oddest extrapolation of the city’s park plan. Namely the concern that a well-run park would increase area traffic, so an essentially static, un-programmed park with no activities would be best. It’s like telling someone mediocre results are the goal of expensive plastic surgery. Huh? Replacing the garage will change Preston Center for a century. Do we want to be remembered for doing the right thing? Or do we want to be remembered for giving in to self-serving greed? The right thing is usually harder and in this case deliciously more expensive, but it’s right, and worth moving mountains to find the money. If the landowners’ ode to self-interest is what’s built, a plaque needs to go up reminding people of our incompetence. We have a visceral reaction to traffic and parking issues, but our gut isn’t always right. Multiple studies dating back decades show that traffic around Preston Road and Northwest Highway has actually diminished. New traffic signal patterns are moving traffic quicker. During the 2016 Preston Road and Northwest Highway Area Plan process, parking studies were conducted proving that, outside weekday lunch hour, parking isn’t an issue either. Therefore, residents shouldn’t overly sweat issues proven to be lessening or simply a nonissue in considering redevelopment. Currently, there are three development levers being pulled. 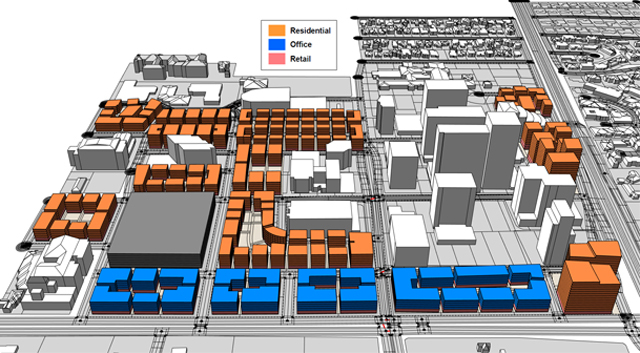 The Preston Center garage reconstruction, Saint Michael and All Angels redevelopment of Frederick Square, and the Pink Wall portion known as Planned Development District 15 (PD-15). 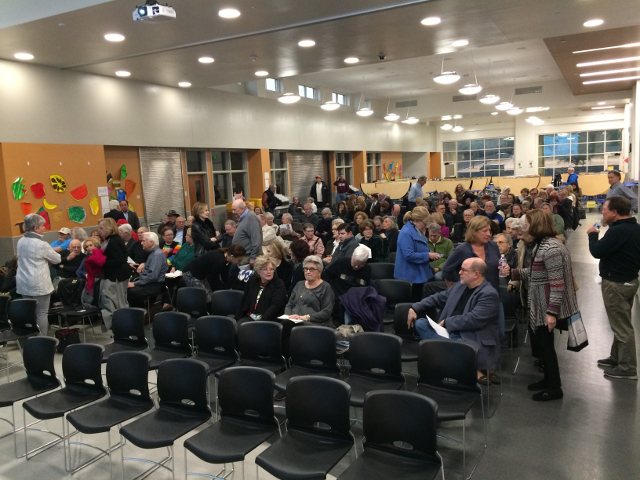 The garage is only just holding its second public meeting Jan. 31. The other two are further along. Saint Michael’s owns the block north of the church from Douglas Avenue to the Tollway. The western end has significant development rights while the eastern end is zoned for three-story residential. The church proposes extending the height granted on the western end to the whole block. The plan calls for two high-rises – one residential, one office – whose total square footage is less than what’s already zoned on the combined block. Building placement preserves downtown views for neighboring high-rises. I’m not a full-fledged fan of the project for other reasons, but if the plan results in less than zoned square footage, there will be less than zoned traffic, too. 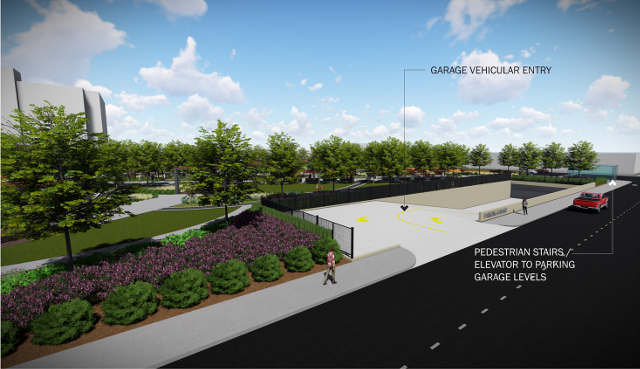 The project provides housing, community green space, and the walkability called for by the Preston Road and Northwest Highway Area Plan co-authored by Laura Miller. Miller opposes the plan, an opposition shared by just one fellow Area Plan committee member. Plan co-author Peter Kline supports the church. Council Member Jennifer Gates is still evaluating the project. On the northeast corner of Northwest Highway and Preston Road is the Pink Wall development dating from the 1950s. Most are two-story garden-style apartments-turned-condos, but between Preston Tower and Athena towers sits PD-15. Developer Hal Anderson’s original plans were for a 40-story Athena and a second Preston Tower. In March 2017, PD-15 complex Preston Place burned leaving residents without a viable redevelopment option due to arcane 1960s PD-15 rules. The 2016 Area Plan did not research the financial viability of rebuilding, instead offering four-story construction that two recent studies say isn’t viable. Council Member Gates has formed two neighborhood committees to reach an agreement enabling redevelopment. Both reached impasse by the towers’ refusal to negotiate. Laura Miller worked with the towers to oppose any compromise. After 18 months, Gates was forced to ask city staff to design a reasonable plan (presented in January). The draft plan isn’t fully-baked, but it’s on paper, a step neither committee managed. Looking back over the past four years of Preston Center-area redevelopment, one name comes up as opposing everything: Laura Miller. Whether it was Luke Crosland’s residential high-rise, Harlan Crow’s sky bridge, Transwestern’s Laurel, or the current crop, she was a non-negotiable “no” to it all – stopping all but one. The irony is that each project is precisely what the Area Plan’s independent consultants said was needed to revitalize the area. As a PD-15 resident, I don’t blindly support either initiative, but I attend meetings and talk with stakeholders to influence. Because even though Miller claims to have massive support for the opposition, there has been no poll to gauge actual sentiment. Instead, HOA representatives vote their personal will for ill-informed residents. That’s monarchy, not democracy. Jon Anderson is a PD-15 resident and award-winning writer reporting on the Preston Center Area for CandysDirt.com and D Magazine.